When and why was runway 07/25 at Kai Tak removed? ... 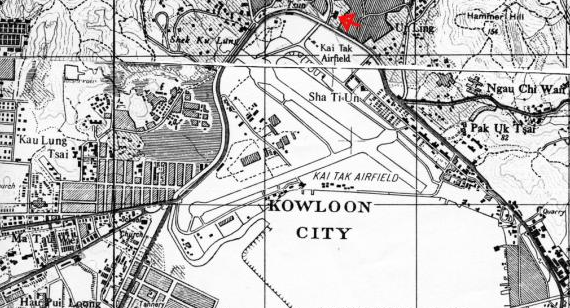 In 1942, the Japanese army expanded Kai Tak, using many Allied prisoner-of-war (POW) labourers, building two concrete runways, 13/31 and 07/25. However, by the time Kai Tak was closed in 1998, only one runway (the famous 13/31) remained. I can find no mention of when runway 07/25 was closed, or why; can someone help answer those questions? The two original short runways (shown above) were actually abandoned c. 1955 in favor of a brand new longer runway built into the bay (completed 1958) to accommodate the new jetliner (the 13/31 you know). The year also saw the start of work on a $110,000,000 project to revolutionize Kai Tak Airport by the construction of a 7,200-ft runway on an artificial promontory reclaimed from the sea and projecting out into the waters of Kowloon Bay. In danger of being knocked off the international airline map by reason of its airport being too small and dangerous for the Comet and the larger conventional airliners, Hong Kong has now taken steps to keep itself firmly on the map. The airport project, when completed in 1958, will provide, for the first time since aviation started in the Colony, facilities for day and night operation all the year round. A note on the design of runways: Two intersecting runways are usually treated as one, as both can't be used simultaneously unless they're sufficiently long and a procedure like LAHSO is used. Kai Tak started with 2 to cover the compass as much as possible, since early on the designers didn't have wind data. It was typical of that era to build 3 runways 60° apart, then later on expand the most useful, and abandon the rest. Not the answer you're looking for? Browse other questions tagged airport aviation-history runways or ask your own question. When an airport has helipads, why would a helicopter take-off or land on a runway? How is tire rubber removed from the runway? Why are months (e.g. December) used to notate a runway?